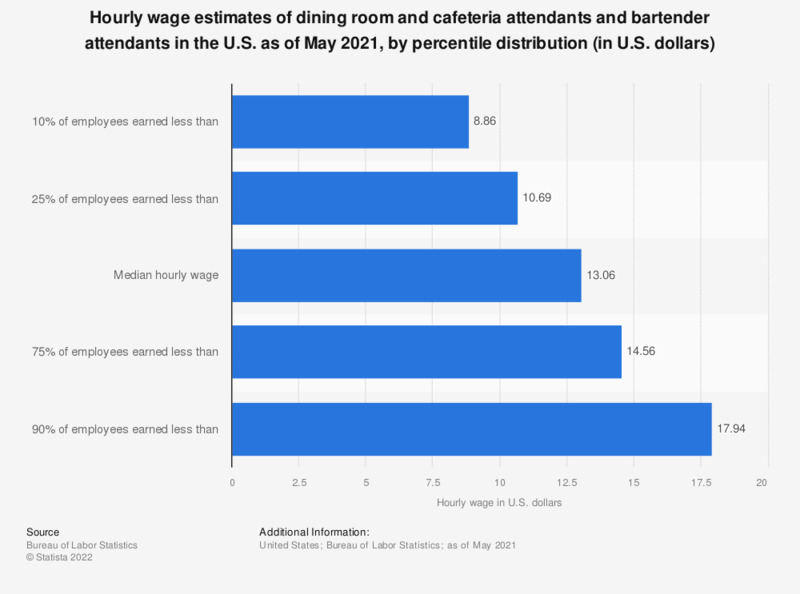 This graph depicts the percentile hourly wage estimates of dining room and cafeteria attendants and bartender helpers in the U.S. in 2017. As of May 2017, ten percent of dining room and cafeteria attendants and bartender helpers earned less than 8.42 U.S. dollars per hour. Dining room and cafeteria attendants and bartender helpers facilitate food service. Clean tables, carry dirty dishes, replace soiled table linens; set tables; replenish supply of clean linens, silverware, glassware, and dishes; supply service bar with food, and serve water, butter, and coffee to patrons. Do you have lunch at the work canteen?